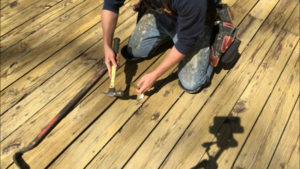 Sun, rain, and foot traffic all work together to damage the surface of your deck. But, not all deck lumber degrades at the same rate. Some boards will show wear and tear early on, while others fare better over time. As far as CIRCULAR SAWS go, this Makita classic is all you really need! Any board that seems broken, or in far worse shape than its neighbors, I mark with a red or blue lumber crayon. 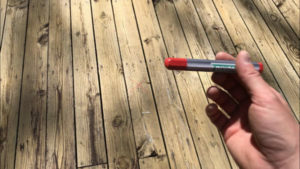 The mark easily shows up against the deck surface. And, it’s long-lasting but not permanent. So, if you change your mind or don’t get to the project quickly, you won’t have a permanent mark on your deck. Once I’ve marked my replaceable boards, I then identify what kind of lumber was used to top the deck. 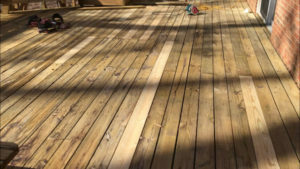 Deck boards are almost always what we call treated 5/4 (“five-quarter”) lumber, which measures 1″ thick and 5-1/2″ wide. 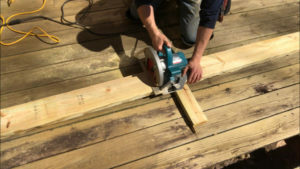 However, some decks are topped with framing lumber, typically 2×6. This lumber is the same width as 5/4 deck boards, but it is 1-1/2″ thick. 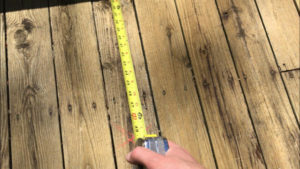 Be sure to look at the edges of your deck boards to determine their thickness. (I have seen two-story decks that had different kinds of lumber for upper level and lower level.) You don’t want to buy and haul an enormous lumber order, only to find you didn’t get the right thickness. When you know your lumber variety, walk around and pull rough measurements of the boards you’d like the replace. I like to write down each individual board number. This way, I can possibly group their replacements together out of longer boards, saving material. Head to your local lumberyard and pick out replacement pieces. Be sure to check edges–treated lumber gets treated roughly in transit, and a lot of boards will have obvious scars and defects. Also, try to get boards that don’t have big knots along the edges. These spots represent possible fracture points. Flip boards to make sure they don’t have big knot hollows on the undersides. Finally, try to get lumber with no highly visible warpage. You want boards that are long and straight for the most part. Small bows and curves can be cranked out, but big swoops in short spans can’t be dealt with. With your new lumber transported to the work site, you can begin removing your old boards. You could just rip these boards out with a pry bar and force. 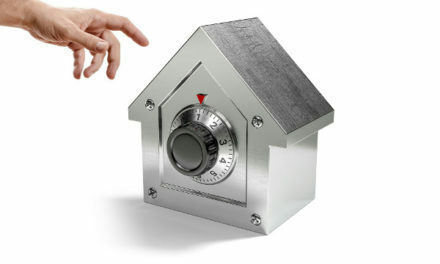 But, you’re likely to damage the surrounding boards that you intend to keep. So, I like to take a more gentle approach. I remove the majority of the fasteners holding the board in place before I attempt to pull it up. If your boards were originally put down with screws, then you can simply back the old screws out. However, if your boards were shot down with nails (as most deck boards are), you’ll have to pry the nails out. 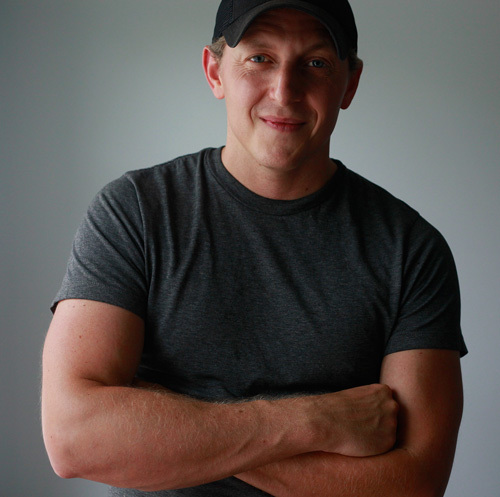 I use a nail puller, or “cat’s paw,” to do this. Just position the prongs of the cat’s paw near a nail head (about 1/8″ away), and tap the strike point on the opposite side of the tool with a hammer. You want the prongs to gouge their way into the wood, driving towards the nail. 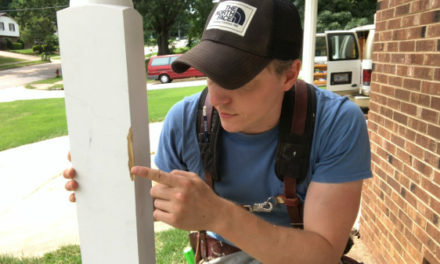 If you do this there right way, the prongs will sink below the nail head and straddle the shaft of the nail, trapping it. Now you can pry the nail puller back with a little force, wrenching the head of the nail up out of the lumber. At this point, just use a hammer or pry bar to lift the nail the rest of the way out. Put the nail safely in your tool belt or a nearby trash bag where nobody can step on it, and repeat the process for the other nails in the board (there will almost always be two nails side by side every 16″-24″). When you have removed the nails from about 2/3 of the board length, you can gently pry up the free end and use the length of the board for leverage to crank out the last few nails. Bend down any nails sticking through the bottom side of the board, then set the board aside. Repeat the process for all of your marked boards. Subtract about 1/8″ from your measurement. This will allow a little wiggle room for the new replacement piece to fall into place easily. 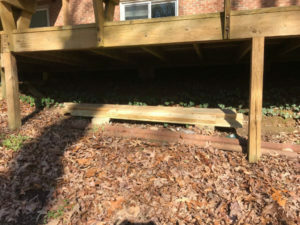 Leaves, pine needles and dirt can fall into the gaps between deck boards and collect on the tops of the structural joists. Take the opportunity to sweep this detritus off so it doesn’t prevent your new boards from sitting down where they’re supposed to be. Also, check the overall condition of your joists. Make sure they aren’t showing any signs of rot. 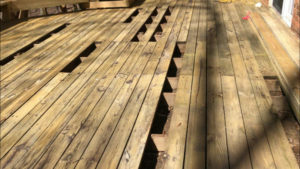 Deck framing typically takes a lot longer to deteriorate because it is protected from the sun by the boards above it. So, joists should be in good shape. 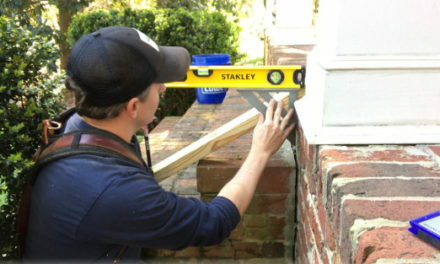 Use a circular saw and speed square to cut replacement pieces to the lengths specified on your list. Be sure to “square up” the ends of your boards first, since treated lumber often comes with ragged cuts on the ends. Also, make sure that you prop up any piece you are going to cut on a scrap piece of lumber. This will provide clearance for the blade, so it does not cut the deck, or anything else, below. 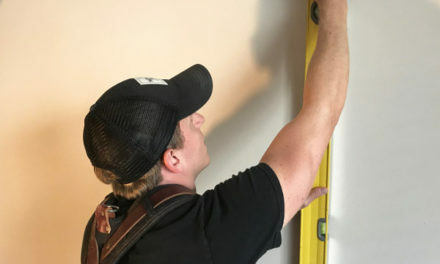 To make cuts, pull and mark measurements by hooking your tape measure onto the square end of the board, drawing out the tape blade, and placing a little “V” mark at your desired cut location. Use your speed square to draw a straight line through the point of the V.
Now, line up your circular saw blade so that it will cut this line in half (or as close to it as possible). Use your speed square as a guide to pass the spinning saw blade through your lumber at this point. Let the waste lumber fall away safely. If the waste lumber is very long, it can help to place another prop piece beneath it as well. Just make sure that the prop block is close to the cut point, so that the cut “opens up” and doesn’t bind the blade. Drive exterior-grade screws into these pre-drilled holes. Make sure that the screws are long enough to sink at least 1-1/2″ into the joist below. You can “countersink” screws by driving them until the heads are just below the deck surface. 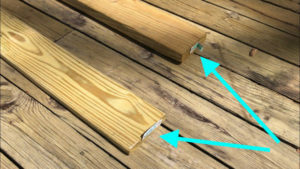 Screws are always preferable to nails when fastening deck boards because they do not loosen over time. Nails can slowly lose their grip in the joist below, especially as seasonal changes cause lumber to expand and contract. 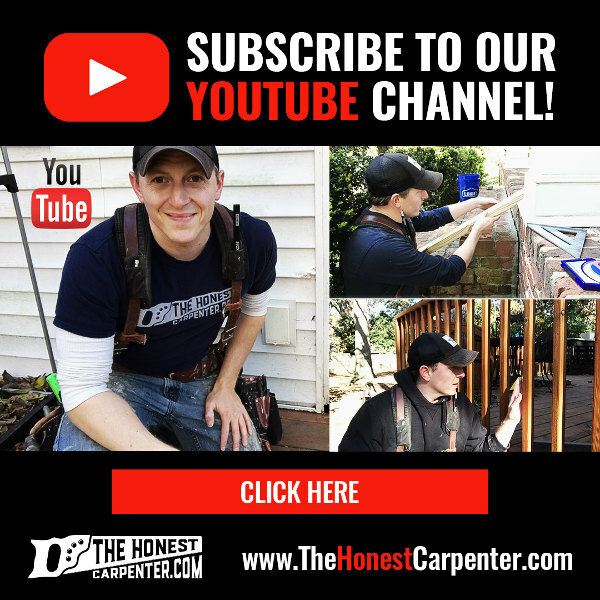 Attach screws at all joist locations. Where the replacement board butts up against an original board, “toenail” the screws by driving them at an angle. This will make sure that they sink into the joist they’re sharing with the next board in line. Just repeat these steps for the rest of your remaining boards. 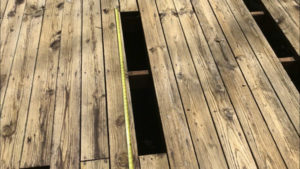 Your new deck boards may stand up higher than the boards around them. This is because new treated lumber is often still wet, while older boards have long since dried out. New boards will most likely sit down as they too slowly dry out. If you have cut-off leftovers, store them out of the way beneath the deck (pictured above). This way, you’ll have them ready if you ever want to carry out more replacements. But, be sure to keep them stacked up on bricks or cinder blocks. Even treated lumber will give over to rot if it sits on the ground for too long!